While at Sancta Clara Monastery, Sister Angelica suffered a terrible accident. A floor scrubbing machine slid out of control and threw her to the ground. Years of intense back pain followed. She limped through the halls of the monastery. Braces, traction, immobilization, shots into the spine; all attempts at a cure failed. Finally spinal fusion surgery was recommended by her physican. The night before her surgery Sr. Angelica prayed that God would help her. "There is a fifty-fifty chance you will never walk again," the surgeon informed her. Laying in her bed, terrified the 33-year old nun made a bargain with God. "Lord, if you let me walk again I'll build you a monastery in the South." After surgery, Angelica could move her legs but she remained in the hospital for two months. Years of pain followed but she was able to move around with braces. True to her word, she contacted the Archbishop of Mobile, Alabama. 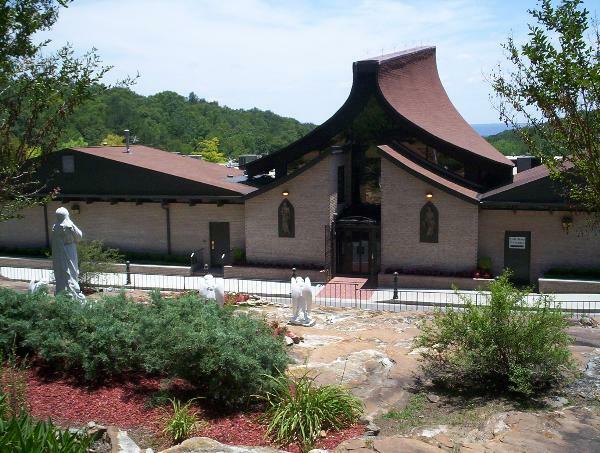 In 1957, Achbishop Toolen invited the Poor Clares to establish a community in Birmingham, Alabama. Originally, Sr. Angelica wanted to work in the South to alleviate racial tensions but the Lord had other plans. With merely $200 she began what has become the largest religious media network in the world, Eternal Word Television Network (EWTN).......for more information on the rest of the story click here.